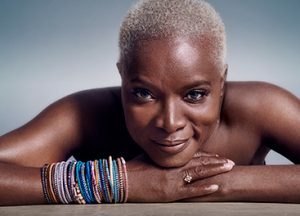 Three-time Grammy Award-winning singer, activist, and humanitarian, Angélique Kidjo was named one of The Guardian’s 100 most inspiring women in the world, was the first woman to appear on Forbes’s list of the Most Powerful Celebrities in Africa, and is included on the BBC’s list of Africa’s 50 most iconic figures. As a UNICEF Goodwill Ambassador, Angélique travels the world advocating on behalf of women, children, and human rights. In 2007, she founded the Batonga Foundation to provide secondary education for girls across Africa and empower the female leaders of tomorrow. From Fair Trade initiatives and curbing climate change to urging a ceasefire in war-torn Sudan, Angélique has proven that artists can be the best agents for change with their unbound imagination and unique way of envisioning the world. In this talk, Angélique discusses the responsibility of artists to use their platform for social justice, the many ways in which we can all give back, and the enormous impact each of us can make in the world.